One of the measures of Bobby Charlton’s universally accepted greatness as a professional was that after he scored his magnificent second goal against a superb Portuguese side in the 1966 World Cup semi-final, it’s reported that a number of the Portuguese players shook Charlton’s hand as he returned to the centre circle to congratulate him for such a remarkable shot. It was unusual even then, but is a striking contrast with the petulant behaviour displayed by both sides during recent meetings. Charlton played for Manchester United throughout his career (with the exception of his final season, which was at Preston North End) and started playing for England in 1959 at the age of 21. Initially an inside forward, he moved to the right wing after surviving the Munich air disaster that decimated the young Manchester United team that Sir Matt Busby had been building. Later on, he moved back inside and worked as an attacking midfielder throughout his prime. Charlton scored on his England debut in a 4-0 defeat of Scotland, with a trademark thumping volley, then twice in his next match, a 2-1 defeat of Portugal. But he then played poorly in a 5-0 defeat by Yugoslavia, understandably as it was in Belgrade, the city United were returning from when the crash occurred. This kept him out of the 1958 World Cup matches although he was in the squad, something that led to criticism of Walter Winterbottom and the FA selection committee. After the World Cup Charlton established himself in the side, scoring hat-tricks against the USA, Luxembourg and Mexico and was a key player by the time the next World Cup came around, Chile in 1962. He scored his 25th goal for England during the 3-1 defeat of Argentina, in only his 38th appearance, some record for a midfielder. Winterbottom had given way to Sir Alf Ramsey in 1963 and Ramsey set his sights on the World Cup that England were to host in 1966. Charlton, Bobby Moore and Gordon Banks were the mainstays that Ramsey built around as he tried various player combinations, another hat-trick coming during a friendly against Switzerland in 1963. In the World Cup proper, the first of three Charlton goals in the tournament came in the second match against Mexico as he dummied a defender with a body swerve and unleashed an unstoppable shot. England then defeated France to meet Argentina in a bruising quarter-final encounter, settled by a single goal from Geoff Hurst. England’s semi-final opponents were rated one of the best footballing sides at the tournament and their star striker, Eusebio, ended the tournament as the highest scorer with nine goals. 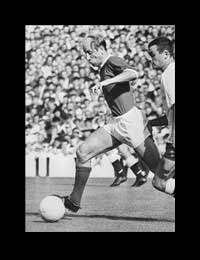 Charlton scored the first, calmly side-footing a loose ball into the net from outside the area after the keeper had come out to stop Roger Hunt’s run. For the second, Geoff Hurst dispossessed a defender near the goal line and pulled the ball back to the ‘D’ where Charlton was running up to support the attack. Without pausing Charlton stroked the ball firmly across the penalty area into the side netting, the goalie rooted to the spot. It was the shock that caused the Portuguese to be so bereft; they just didn’t expect Charlton to do that. England survived a Portuguese penalty and late rally to go into the final against West Germany. In the final Bobby Charlton and a young Franz Beckenbauer largely cancelled each other out, but he, alongside Bobby Moore and Geoff Hurst was one of the standout performers of the World Cup. Still a core member of the team, Charlton went to the 1970 World Cup although by then he was 35 and, with his balding head, suffered more than most from the extreme heat. This was compounded by the insistence that matches involving European teams were played at noon to fit in with television schedules. After gruelling group matches against Czechoslovakia, Romania and Brazil, England met West Germany in the quarter-final with Charlton once more pitted against Beckenbauer, and keeping him very quiet. England had taken a two-goal lead, through Alan Mullery in the first half and Martin Peters five minutes into the second, when Beckenbauer managed to escape Charlton’s attentions for once and shot tamely but Peter Bonetti, the England reserve keeper, allowed it to slip under his body. Charlton was then substituted and many claim that this allowed Beckenbauer free reign to complete the German comeback. Charlton himself denies this as do most opinion holders based in the UK, but German players and commentators believe it to be true. It is perhaps a moot point as Charlton was beginning to flag and may not have been able to constrain Beckenbauer anyway. Also his replacement, Colin Bell, was lively, putting in a great cross that Hurst couldn’t convert and nearly scoring himself with a drive that Sepp Maier, the German keeper, struggled to hold. On the plane home from Mexico, both he and his brother Jack asked Ramsey not to consider them for international duty again. That game against West Germany had been Charlton’s 106th cap, then a world record, let alone an English one, although Bobby Moore overtook him a couple of years later, and both were eventually surpassed by Peter Shilton, with his 125 caps. If he’d been picked to play in any of the matches of the 1962 World Cup, Charlton would now be the only English player to have appeared in four tournaments, as it is; he shares the record of three with nine other players. In 1966 Charlton also won both the English and European Footballer of the Year awards, and he still holds the record, at 49, for the most international goals scored for England, an amazing feat considering he was a midfielder. Gary Lineker, who stopped one goal short of that record, said that Charlton deserved to keep it as he was a much better player and scored far better goals! Respect for Charlton spread throughout the world and for decades it was said that the four words of English that would be understood anywhere on the globe were: “Bobby Charlton, Manchester United”.